Oneonta Job Corps Academy as the recipient of the NBT Bank, Quality of Life Award in recognition of their programs and services. Oneonta Job Corps Academy (OJCA), opened in 1980 and is now one of the 126 Job Corps centers found around the country that offers dozens of different vocational opportunities to under-privilege youth ages 16 to 24 years of age, along with individuals with disabilities. The Oneonta Job Corps Academy hosts nine traditional trades in three different clusters: Medical (Clinical Medical Assistant, Certified Nursing Assistant, and Medical Admin Assistant); Automotive (Auto Technician and Auto Collision and Repair); Construction (Electrical, Facility Maintenance, Cement Masonry, and Tile Setting). In addition to these nine initial trades, OJCA is also home to the SMART Grid Advanced Training program that includes Overhead Lineman, Underground Residential Distribution, and Smart Meter and Instrumentation Technician. OJCA continues to be more and more involved in the community. First and foremost, it is a source of employment for nearly 150 people living within the local region. Both staff and students have performed thousands of hours of community service across the region including helping with parking for community events, assisting at the Susquehanna Animal Shelter, the Salvation Army Sunday Meal with a Message, Art Festivals, and so much more. OJCA was involved with the Oneonta Airport project, a two-year renovation project that incorporated the use of about half a dozen trades, including Facility Maintenance, Cement Mason, and Electrical. OJCA has hosted or co-hosts community events such as that Annual OJCA Community Ballgame every August complete with free admission, contests, prizes, and of course …fireworks! Most recently Oneonta Job Corps in partnership with Hudson Valley Community College, SkyOp, and the Oneonta Municipal Airport, is offering an exciting new Advanced Training program for Drone Pilot. Ten students will prepare for the FAA Part 107 Remote Pilot exam to become a licensed commercial drone pilot. 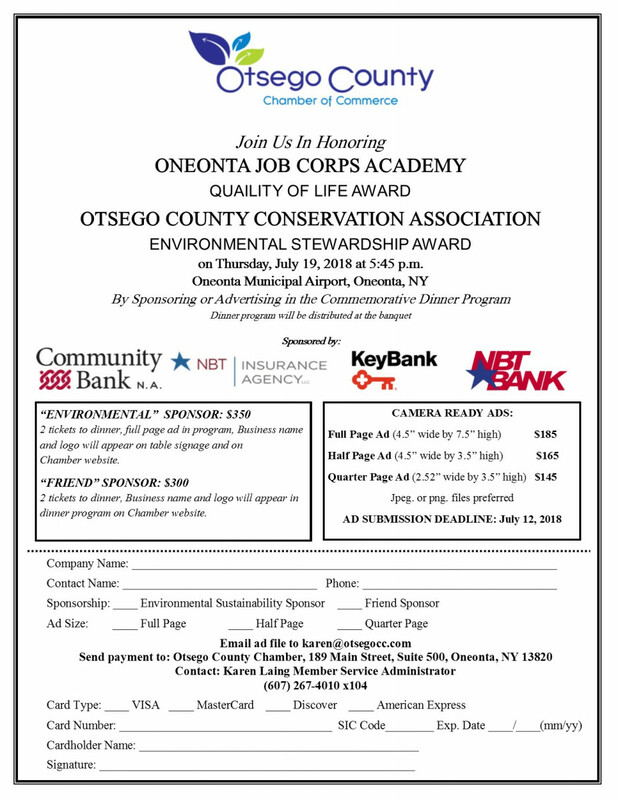 OCCA was instrumental in helping Otsego County start the county-wide recycling program. In 1973, OCCA started the first glass recycling in partnership with the Cooperstown League of Conservation Voters which expanded to accept aluminum. This center stayed in operation until 1988. Since the mid-1990’s, OCCA has been working with Otsego County and various local jurisdictions to help set up, promote, and educate the public on the importance of recycling. In the early 2000’s, OCCA partnered with the Village of Cooperstown to purchase and set up recycling containers in the village. Their recycling committee is still active in lobbying for recycling in the county and are active at the monthly Solid Waste and Environmental Concerns Committee (County Board sub-committee). They are currently partnering with the OC Soil and Water Conservation District to administer the Agricultural Plastics Recycling program, working with local partners to determine the feasibility of Styrofoam recycling, collect “hard-to-get-rid-of” recyclables at Earth Festival, and coordinate volunteers for Household Hazardous Waste Day. We look forward to honoring and celebrating with our award winners on July 19, 2018 and look forward to seeing you there.